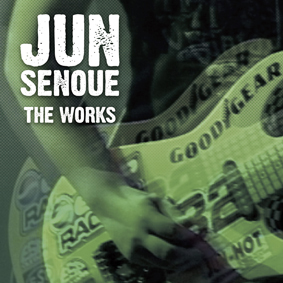 Released last November, “The Works” is as much a collection of Senoue’s best pieces , as it is a real celebration of some of the masterful work Jun has produced not only during his long reign working for SEGA, but with his many unique side-projects as well. What really puts this compilation on a pedestal over the similar releases last year (True Colours, Best of C40) was the quantity of material that wa previously unheard of on western shores. I think the first thing that becomes apparent with this album is the incredible range of talent Senoue has worked with over the years. I’m sure many would kill to have worked with the likes of Eric Martin (of Mr. Big) and Ted Poley (Danger Danger), as well as to have produced some memorable power anthems of this calibre in the process. The album blasts off with three such fine examples including “American Dream”, “Sons of Angels” and “Batter Up!” which ooze that definitive Senoue guitar, thunderously supported in vocals by Martin. Again the frustrating matter for me regarding these these tracks is that (particularly with the tracks taken from the Japanese Baseball title Pro Team Yakyu wo Tsukuro! 2) there are more of these tracks out there that have not yet made it to print on any CD. As well as these examples of collaborative work, the album plays host to a selection of acoustic and instrumental pieces. What is most notable here particularly during the absence of guitar-heavy tunes is the sheer diversity of what Senoue can produce – from the gorgeously plinky-plonk piano piece in “Afternoon Tea”, to the ambience of “Dusk of the stadium”. Although I don’t particularly judge this to be a negative, the album does not contain a large number of Sonic related tracks. Personally, this is refreshing considering the hardened music collector would find this simply a repetition of material they have heard time and again. Even in this case however, those tracks we have come to know and love have been totally revamped and reworked. “After the Adventure”, as the name insinuates is a reworking of material from Sonic Adventure, the emphasis here being the Station Square theme composed a-la 70’s lounge stylee. Not only this, “Cheerleaders A-Go-Go” mashes up Space Channel 5’s theme with the likes of “Open Your Heart” and (again as the name suggests) “Skydeck A-Go-Go” from Sonic Adventure to create an incandescent harmony of favourites. If you were lucky enough to pick up the JXJ album a few years back, you’ll recognise “Where I want to be” , with Junko’s vocals replaced by Sweetnam. I must admit this is the only track I remain polarised on, as I think the English lyrics sound more forced than their Japanese counterparts. There seems to be no loss of steam as you plough through the track listing, with the up-tempo Daytona USA and SEGA Rally tracks keeping the pace all the way through to the end, before ending on “My Own Destiny”, a beautiful mid-paced , ambling-lead finisher. From the AC/DC-influenced guitar licks of the stylish rock version of “The Star Spangled Banner” to the serene and sublime solos of “My Own Destiny”, The Works is yet another classy compilation from SEGA’s favourite – hell, everyone’s favourite – axe-wielding guitar god, Jun Senoue. Featuring a massive spectrum of styles and sounds, this awesome album will have even the most ardent and experienced rock fanatic slavering and salivating over its powerful melodies and captivating riffs; it truly is a wonderful display of what real rock should sound like, and is also a prime example of why the guitar (however non-mainstream it may be) remains a force to be reckoned with. Jun Senoue. No matter how you pronounce his name, you have to respect all that he has done for Sonic. His latest solo album features some of that Sonic you love, but would be more accurately described as a pallet of his work over the years. From sports games (J League Pro Soccer) to driving simulators (Daytona USA), you’re likely to find a song on the disc from a genre close to your heart. Being a Sonic remix lover, “Cheerleaders A-Go-Go” and “After The Adventure” do stand out as two of my favourite tracks. The first is a remix of Space Channel 5 with the “Live & Learn” riff, which strangely grows on you, while “After The Adventure” is a relaxing, more acoustic sounding rendition of “It Doesn’t Matter”. The JS vs LB remix of “Dreams of an Absolution” is there too if you haven’t heard it on any of the other Sonic albums it was released on. Not being very familiar with the rest of the games, I found “Soul on Desert” to be the most exciting track on the album; it really does have a desert racing feel to it that is hard too describe. Thumbs Up! : The first time listening to “Cheerleaders A-Go-Go” and wondering if I was going mental. Then squealing like a little girl when I realised the riff was intentional! 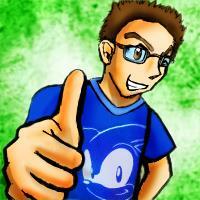 Thumbs Down: I would have loved more representation from the Sonic franchise, you can never have enough remixes. 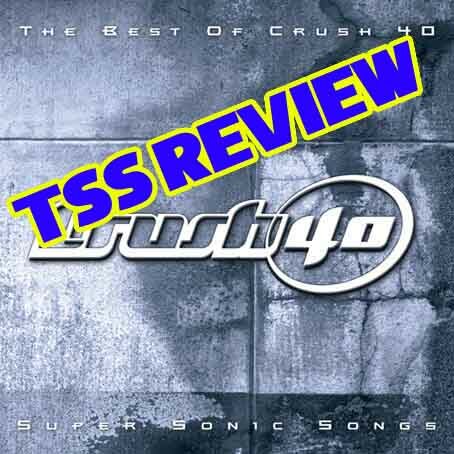 Similar to Crush 40’s recent compilation, I found myself phasing in and out of this because a good deal of the songs are very similar in style. However at the same time, despite this there were still certain songs that really jumped out at me and I loved from start to finish. “Lift You Up!”“Road to Win” really reminded me of some of the stuff he came up with for SA2; really energetic and uplifting (as the name suggests!). also grabbed me with its almost magical and nostalgic quality to it, another fantastic cheerful track with some lovely piano work too. As another bonus to Sonic fans, there are neat lounge remixes of Station Square and It Doesn’t Matter within “After The Adventure”, and the surreal “Cheerleaders A-Go-Go” features a few sneaks of memorable Sonic tunes. 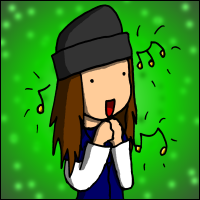 I also found myself loving the short acoustic guitar instrumentals of “Afternoon Tea” and “British Rain”, and “My Own Destiny” was a brilliant ending. 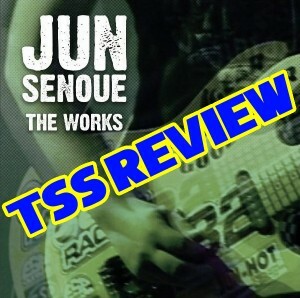 Thumbs Up: The fantastic selection that really shows off Jun’s versatility – from his classic rock stylings to relaxing acoustic and catchy techno mixes. Thumbs Down: Track order can be a little uninspiring as an overall album experience, with many similar songs grouped together too. A fantastic collection of pieces, including some wonderful reworkings of old classics and huge selection of new and unheard material. 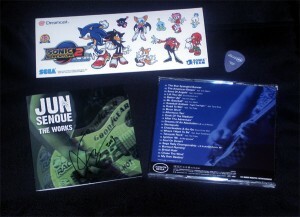 Don’t be put off by the lack of Sonic tunes if you are a Senoue fan! The Works is still available for purchase from play-asia, and CD-Japan. Got your own opinions on the album? Think we’ve got it all wrong? Let us know in the comments! The Countdown to Project 24 – A Day of Music and Prizes! With only 10 days to go until Project 24 kicks in, it’s about time we showed off just some of the reasons you should tune in! 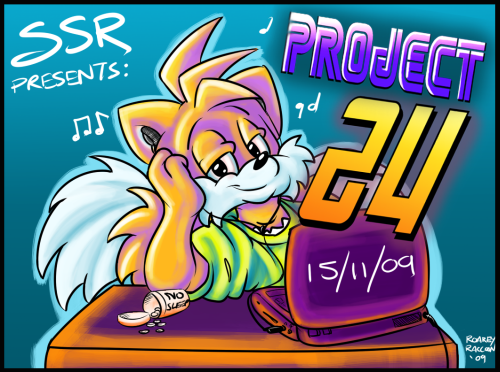 Project 24 is an all-day radio livecast on SEGASonic:Radio, the Sonic Stadium‘s much-loved radio channel with 24/7 music and shows hosted by a swarm of SSR DJs, taking place from 0:00GMT on Sunday the 15th of November and continuing until Midnight the next day! Spearheading the organisation of the project is resident SS:R DJ and Sonic Remix Expert BlitzChris, who has painstakingly promoted the event and even ressurrected some DJs from the bygone days of the SS:R airwaves such as Hawkz and Iceman to brush off the dust on the headset and to take to their shows once more! Also joining the ranks during the day are TSS Staff writer and fangirl heart-throb Slingerland, Scottish random-rambler JayZeach, a delicious slice of Speedknux Pie, the husband-wife antics of AAUK and EchoHawk on Radio Redux and the all-too hillarious flagship show The Sonic Hour with our hosts Dreadknux and Roareye…just to mention a few! Even I will be cracking out a collection of my favourite face-melters and metal monsters for a T-TIME! special! 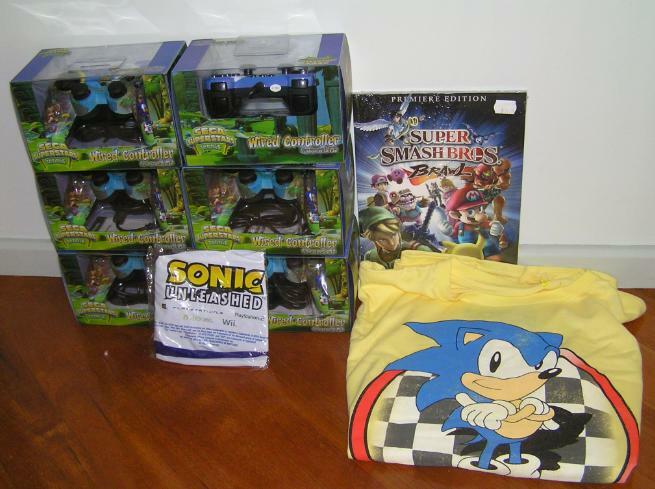 Not only do you have a whole day of back-to-back tunes, requests, programming and chat on the Sonic Stadium IRC, there will be a huge hoard of prizes to be won during the day including T-Shirts, Sonic Unleashed Beachballs, SEGA Superstars Tennis branded controllers and Smash Brothers Prima Guides. 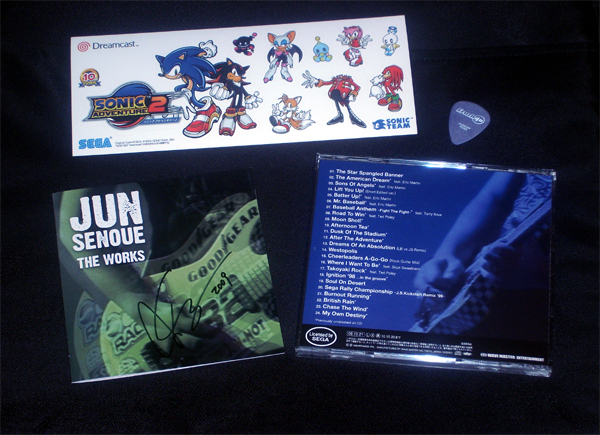 Because this simply is not enough, we’ve even got a signed copy of Jun Senoue’s new album “The Works” to giveaway, yes, GIVE, to one of you lucky hedgehogs or hedgehogettes, complete with Sonic Adventure 2 stickers and an official Jun Senoue guitar pick, used by the man himself! How do you win this you ask? Well…we’ll have more details of that next week! All I can say is, keep Sunday the 15th of November free in your diary! 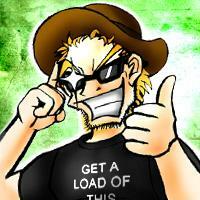 (Props to Roarz for the awesome artwork!). 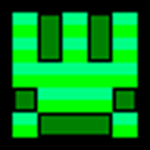 Check out more Project 24 details on the Project 24 forum thread!